Autumn arrived in drifts of mist and dripping rain. 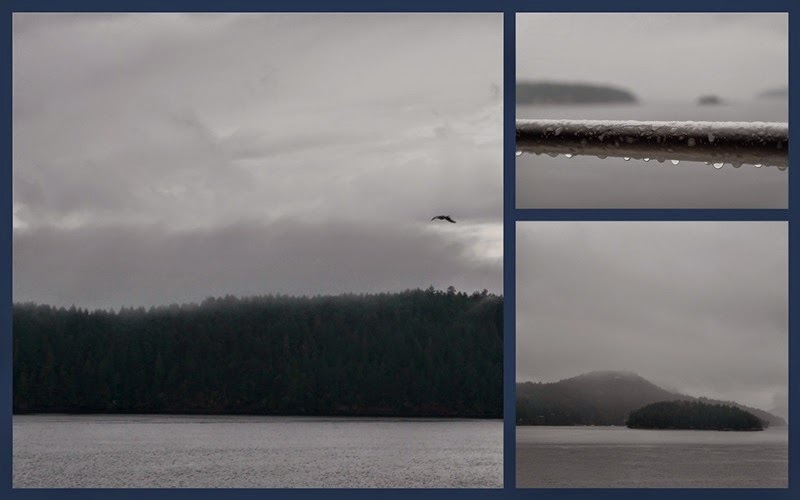 A quiet symphony of greys colored our mid-week ferry ride. I thought of naming this post "50 *Shades * Gr*ey, but thought better of it, not wanting the traffic that might engender. There are surely more than that number in this mist-laden landscape. The lighthouse is the brightest spot in the above photo, but even its bright red bands are dulled. Clouds pile up over the islands fading into the horizon. When seeing sights like these (colors straight out of the camera), it's hard to remember the vibrant blues and greens of sunnier days. A ferry railing drips with rain. There's beauty in the grey, mysterious and soft: an abstract world that beguiles the imagination with possibilities. The sun has returned, but I know we'll have more of these misty days. Dear Sweet Lorrie, your talent for photography is growing by leap and bounds. These shots are so dramatic . . . I love them! Each one stands alone as brilliant...great job! I am so happy that you shared them with us. Maybe you need to think about putting a show together. Now, on the lighter side . . . the tile of your post put a song in my heart that I will be singing the rest of the night. I can hear Billie Holiday singing this in my head as I type this. Love that shot of the ferry rail--beautiful! Even though I adore sunshine and blue skies, I love mist on the headlands and mountains--makes me happy! Wonderful photos I could almost be with you on the ferry. How beautiful those photos are. I really like the misty gray wprld. Beautiful natural colors. Even in a grey fall day, there is beauty. And you certainly found it. I love moody weather shots! As your photos prove, there is abundant beauty during rainy weather. Ooooo, dark & moody...very mysterious! Well done, Lorrie! I didn't know Judith was hosting a Mosaic Monday meme. I'll have to check it out & get back to blogging with such inspiration. The scenery is still lovely, even while it is grey..The lighthouse is my favorite.. Have a happy week ahead! Lorrie, you've captured our Pacific Northwest perfectly. We had a blip of summer in Seattle yesterday, but today the sky is as you have captured them with your camera! Have a sunny week despite the clouds! Definitely grey and mysterious looking, I hope you get sunny skies and a pop of colour soon. Oh the misty feel of those photos. Solitary and lovely. Lovely photos....every season brings it's beauty. I love the subtle greys - very atmospheric! Even with the gray, your pictures make it all beautiful...I like gray but not for days and days as we seem to get here in winter. Lovely images. I think black and white makes the ordinary (like a change of weather) much more dramatic ... a magical setting ... I can hear the fairy music! ;) Happy Mosaic Monday! When grey days come in summer it's depressing but somehow in the Autumn it just makes you want to cozy up at home, enjoy a good book or movie, light a candle…. Cooler weather here, too. Rather refreshing after the little heat wave that we had last week. I rather enjoy stormy photos, dark, gray, full of texture and interest, as are yours. Love the drops of water. How incredibly beautiful. Your photos have me missing the coast. Oh how beautiful. I try to see the beauty in the rain as it is often the weather here. I am in the Pacific Northwest and looks like you are as well. I'm visiting from Mosaic Monday. Simply stunning photos, Lorrie, especially the last one. We are having gray days here too, and I really like them, and looking up at the varied clouds. I love the mists and fogs - so sweet and quiet. The photos take on a wonderful tone and "color" in the fog. Great shots. I think the summer of sunshine for us here has broken - but I look forward to foggy days and a few sunny ones too. yes, it’s grey, but even a landscape dressed in grey can be beautiful. There's something about grey fog, clouds and misty days. They make we want to be inside where it's warm and cozy.... after taking photos of it though. It is beautiful, Lorrie. I hope you get some sunny breaks too. Love your 'black, white and many shades of grey' photos. I loved yesterday's blue skies and meals on the patio...and I'm a little reluctant to embrace the 'grey'. But it has a beauty all its own! It's definitely a fallish feeling I'm getting here on your blog - makes me glad that we have a load of firewood coming this week. :-) Stay warm! What lovely shades of grey in autumn, indeed! Beautiful photo instants captured through your camera lens! So, hope that autumn will be sunny in october! All the best! Though I prefer sunshine your photos are gorgeous. I especially am drawn to the lighthouse, one of my favorite things. A couple patches of blue in our sky today, but there is indeed a crispness in the air.